It’s Friday, and the weekend is upon us. Around here, that means contractor-free days. Not that the guys who’ve been here every day for the last three weeks aren’t really nice, but it is such a treat to walk freely – no plastic door coverings – for a couple of days. Last weekend, I celebrated the Fourth of July, and three full days without workmen, by canning. Saturday, I had the pleasure of participating in a fantastic Can-O-Rama, hosted by a food52 member – Christine – in her inviting Carlisle, PA, kitchen. 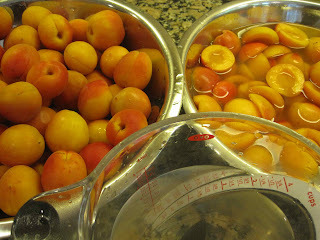 Twelve of us gathered with half a bushel of apricots and 28 quarts of sour cherries to “put-up” old-style. There were moments that day, looking around, when I thought – anywhere in the world, almost any era, there would have been similar scenes of women gathering with the sole purpose of easing the enormous effort/burden of preserving the harvest. Apricots and sour cherries are a great example of this. They ripen in two weeks and then they are gone. 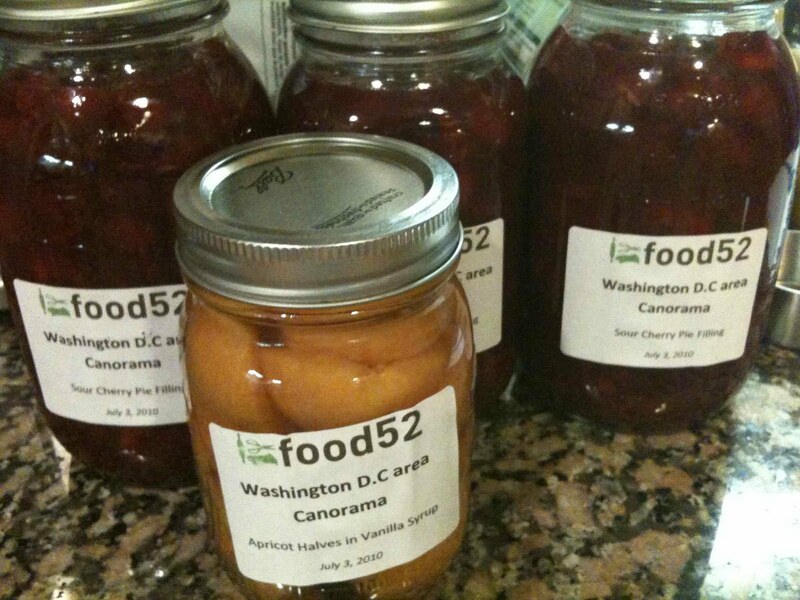 They are ambrosial fresh off the tree, but retain such a bright flavor when canned, they cry out to be put in jars. 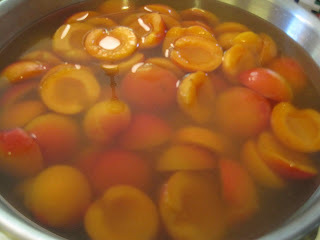 I love the taste of apricots fresh, but somehow they are even better with a little bit of cooking. I’ve included the recipe here for raw packed apricot halves in a very light vanilla syrup. These are sweet and tart and are perfect addition to a piece of pound cake, a bowl of vanilla ice cream, or even lowfat yogurt, if you’re being virtuous. I’ve also used them with pork roasts and think they might be an interesting addition to barbeque sauce (I’ll be testing that theory later this summer.) Scroll down for the apricot recipe. Right around July 4th on the East Coast, for several years, I’ve canned 8 quarts of sour cherry pie filling. I taught the food52’ers all about canning, and divulged my very easy recipe for this pie filling, so now I thought I’d share it here. When Thanksgiving rolls around, I’ll roll out a pie crust, empty a one quart jar into the crust, cover with another lattice-d crust, et voila – summer in every bite. 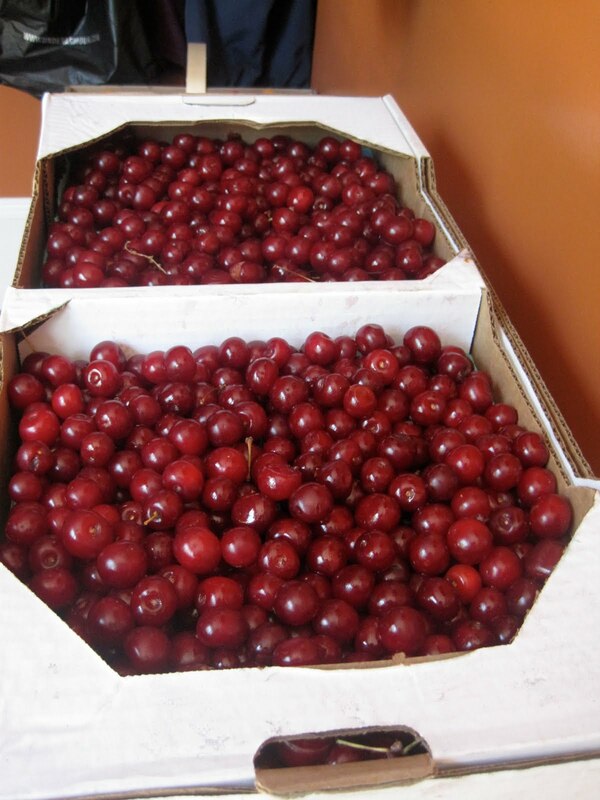 Sour, or tart, cherries, are available for two or three weeks in late June/early July. They are very delicate and should be pitted and used within two days, but preferably same day you get them. You will never find sour cherries at the grocery store – you need to make a connection with a farmer/orchard. 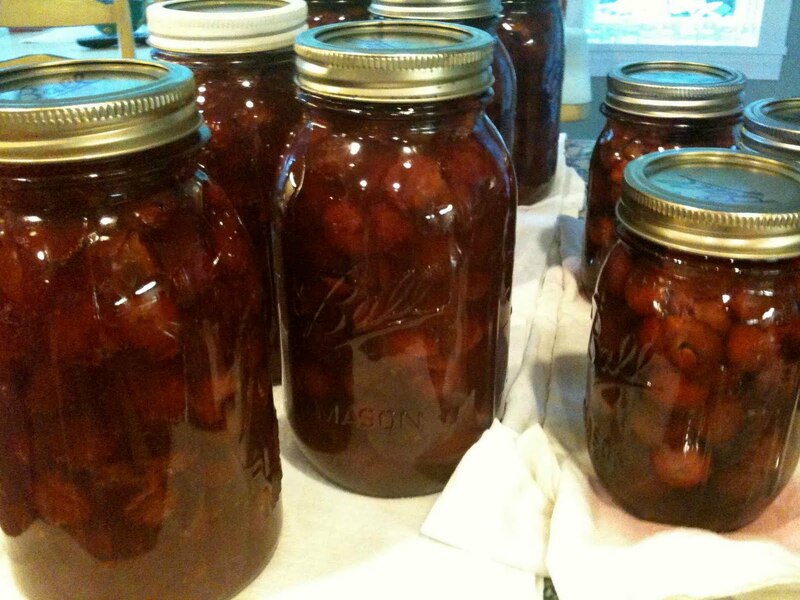 Once you know when your cherries will arrive, make sure you have all the ingredients on hand, including jars. Make this pie at Thanksgiving and you will have a very happy crowd. Makes one 9” pie, or a cobbler, buckle or crisp. Clean and pit cherries. Pit over a bowl to capture all the juices. Put water, sugar, lemon juice and cornstarch in a large, heavy pan and bring to a boil, stirring constantly. Add the fruit, bring to a simmer and cook about 5 minutes. Add extract, stir well. Funnel the filling into a quart jar leaving 1” headroom. Process in a boiling water bath for 30 minutes. After processing, remove to a towel, separate the jars and allow them to cool naturally. Try not to disturb the jars for 24 hours, then test the seal. To bake a pie, you’ll need two basic pie crusts. Roll out the bottom crust and line a 9” pan. Pour in the pie filling. Roll out the top crust, and cut into strips for a lattice for the top crust. Pinch the crusts together and make a pretty edge. Place the whole pie in the freezer for 20 minutes, or refrigerate for an hour. Bake in a preheated 425° oven for 20 minutes, then reduce the temperature to 350° and bake another 45-55 minutes until the filling is bubbling. curious about those pints? scroll down for another quick recipe with cherries! This is a beautiful jar to give as a gift, if you can bear to part with it. The apricots are delicious over ice cream, pound cake, or used for a sauce to serve with pork or chicken. I just eat them out of the jar, ice cold. You must use exceptional, perfect, beautiful apricots for this recipe. 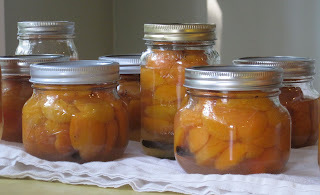 Buy freshly picked apricots two or three days before canning and allow them to finish ripening in a cool spot (basement? garage?) but not the refrigerator. The scent of them ripening will drive you crazy. This method will also work for pears or peaches. Consider other flavorings – ginger, star anise, clove, cardamom. Prepare syrup by combining sugar and water with whole vanilla beans, heating gently until the sugar has dissolved. Wash, dry, halve and pit the apricots. Put them in a large bowl filled with water and the juice of three or four lemons, so they don’t brown as you finish the process. 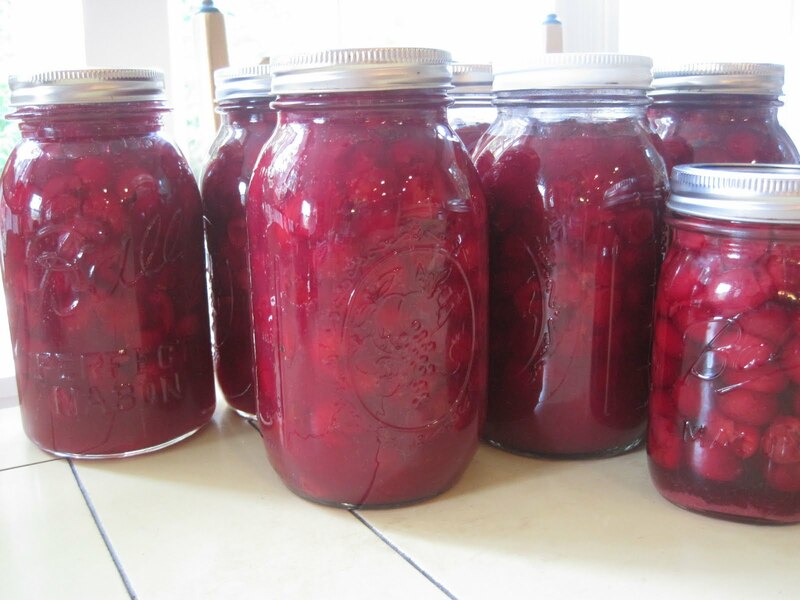 Pack the fruit directly into sterilized canning jars. Pack tightly, without bruising. You can nestle the apricots together, like spoons, to fit more in. The packing is the hard part of the recipe. After processing, the fruit will float to the surface, so try to get as many apricots as possible into your jar. Pour lemon juice over the fruit. Pour hot syrup over the fruit, leaving 1/2″ headroom. Wipe the rims of the jars, add lids and rings and finger tighten. Process in a water bath for 25 minutes. After processing, allow jars to rest on a folded towel. Try not to move them for 24 hours. Check seals. Here’s another quick recipe if you have any cherries leftover! Make a simple syrup by simmering the water, sugar and chipotle until the sugar is dissolved. Allow to steep for 1 hour. Pit the cherries and pack into a sterilized pint jar. 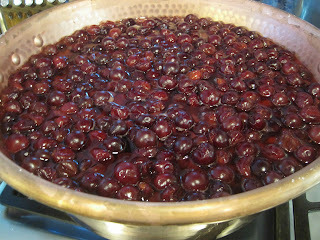 Warm the syrup and pour over the cherries, leaving 1/2″ headroom. Stem and seed the chipotle. Cut into 1/2″ rings and place one ring in each jar. Process for 25 minutes in a boiling water bath. Remove from processor and allow to cool naturally. These are smoky, hot and wonderful cherries. I’m marinating some in maraschino liqueur for spicy Old Fashioneds. And I’ll be making a bbq sauce for sure, as they’ll be perfect with pork shoulder. Love it! And I am so pleased to hve pictures of how to pack them in there tightly. More apricots on the agenda for tommorrow for me and Eliza. I'm plain sick of cherries though! I love this Cathy! I did lots of strawberries in Vanilla syrup and you are right, it is a great way to preserve their flavor! I just wanted to let you know that it is considered unsafe to can using cornstarch. Cornstarch thickens while it is still hot and can prevent the correct heat penetration, plus long heating can cause it to break down and get watery. 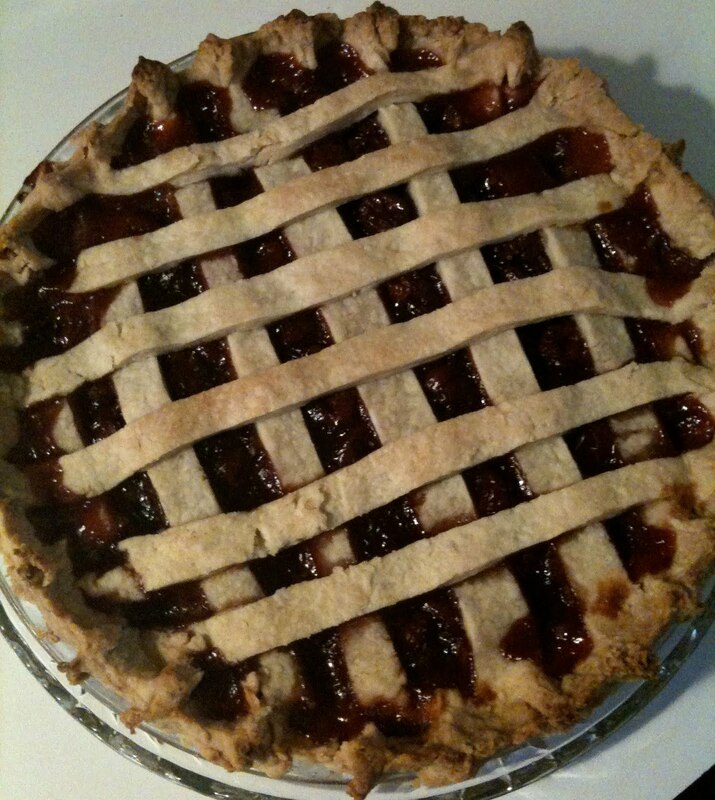 You can use a product called Clear Jel, or just add the corn starch when you pour the filling into the pie crust. Thank you very much for your comment, Robin. I've never heard that, and have used cornstarch for decades with no ill effects. I'll search out some Clear Jel, now that I know, and use that in the future. Thanks again! Oh how I wish I could have been part of the Can-O-Rama! It looks like it was great fun and your recipes look fantastic. Hope to be around for our next gathering. Holly – We missed you! I'm sure there will be a Fall get-together. We all have so much fun together! Cherries and chipotle sounds like a winning combination! Loved this post. 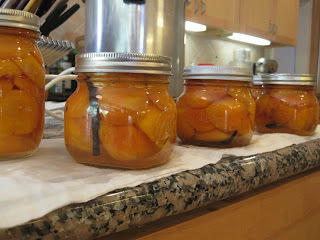 My husband just happened to hear you on NPR the day I was trying my first canning project, spiced peaches. I'm very eager to learn from your site. Question: when I had loaded the peaches into the pints, the liquid that I had only filled half of each pint jar. I went ahead and processed them for 35 mins., and even heard the wonderful little pop sound later. 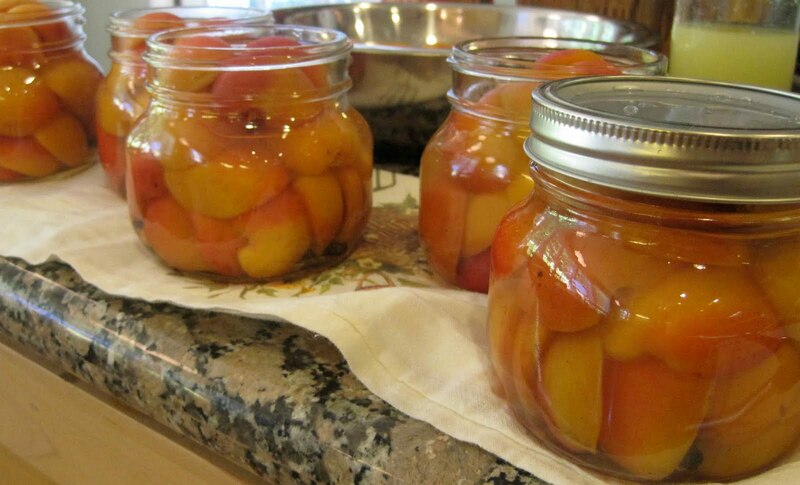 We were wondering if the peaches will be okay because the liquid didn't fill the jars? Anything you could tell us would be appreciated! Nathalie, I would reprocess the jars, adding sufficient syrup to cover the fruit. Did you pack the fruit tightly into the jar before adding he syrup? Sorry, it's taken me while to get back to you. I'm a teacher and we have prep. all this week for the new year on Monday! I did pack the peaches tightly in. The recipe said whole peaches, so only two would fit in the pint jar. I'm thinking of cutting them into halves next time. Perhaps I'll just use what I've already done, and double the syrup next time. Is there a reason why the liquid should be to the top? and fruit packed in tight? Sorry, not anonymous. It's Nathalie C.
I'm preparing to do some beautiful peaches today in the vanilla syrup. You don't say to peel the apricots, but should I peel the peaches for this recipe? Yes, I would definitely peel the peaches first. Yum, the vanilla syrup recipe looks delicious! Would you peel if you were using pears in that recipe?